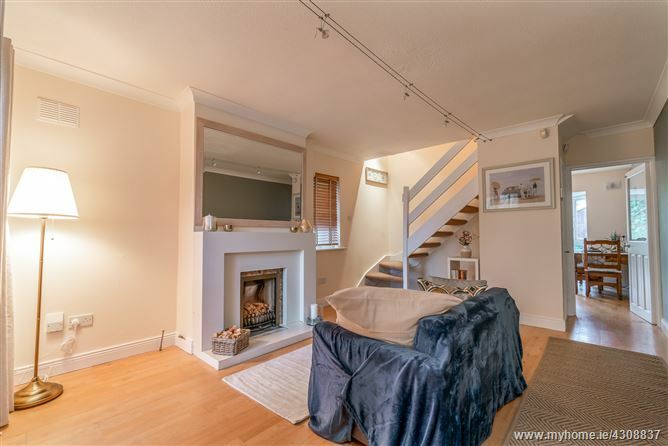 Casey Kennedy are delighted to bring to the market this two bedroom end of terrace townhouse tucked away in this ever popular and hugely convenient residential development. No.1 provides well laid out and spacious accommodation c.72sqm/777sqft oozing with natural light. The property also boasts a large secluded rear garden c.40 Ft long with a significant addition room to the side of the house.The garden has a west facing aspect. Off street parking to the front. This house offers room to extend to the side of the house subject to planning permission. The is a previous lapsed planning permission from 2001 for the house. Several other houses within the development have completed this style of extension. Accommodation briefly comprises Entrance porch, livingroom, kitchen/dining room, 2 double bedrooms and a family bathroom. The location is excellent, situated off Stillorgan Park Road within this sought after residential cul-de-sac and offering a wide variety of amenities nearby. The property is within easy walking distance of the N11 QBC for access by public transport to the city centre, whilst Blackrock and Stillorgan Villages are within walking with their shopping centres, range of boutique shops and restaurants. There are numerous schools within walking distance as well as access to the city centre and the south coast on the DART. Entrance Porch: 1.26m x 1.1m: Floor to ceiling window. Door to living room. Living Room: 5.32m x 3.73m: Feature open fireplace. Staircase. Understairs storage press. Door to. . .
Kitchen/Dining Room: 3.73m x 3.34m: Large feature bay window with sliding PVC glazed doors to rear garden. Modern fitted kitchen. Tiled floor. Side Entrance and access to the garden. Bedroom 1: 3.73m x 3.31m: Double bedroom overlooking the rear garden with extensive range of fitted wardrobes. Bathroom: 2.72m x 1.71m: Bathroom with bath, wc, whb. Hotpress.